Can You Benefit From The Pomodoro Technique? If only there were more hours in a day. For most office workers, this is something we find ourselves asking all too often. Despite our earnest desire to check off more on our to-do list, much of our daily schedule is littered with interruptions. 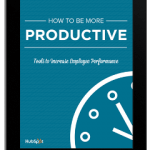 To help you navigate the challenges of time management, we’ve created ‘How to Be More Productive: Tools to Increase Employee Performance.’ In our new guide, we’ll dive into the cause and effect of workplace procrastination and provide practical steps to accomplish more in your day.